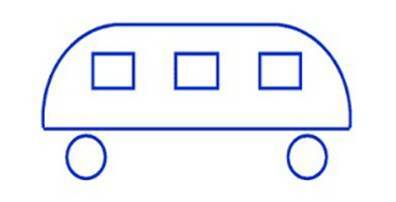 Apparently, pre-schoolers and adults were asked whether this bus is traveling left or right. Most of the adults had no answer. 90% of the preschoolers had the correct answer (in the comments). Strange that we lose the ability to see the obvious as we know more. ← Emphasis & beauty: More … or less? The bus is traveling left because you can’t see the door to get on. If a bus, it would travel right if in Britain and in many other lands. But I agree with those commentors who say it’s not a bus. I say it’s a UFO. I could not figure this out and I am usually quite good at such puzzles, but Phil’s comment explains why. I am a Brit that has lived 25 years in the UK (driving on the left) and 30+ years in Austria (driving on the right), so it’s no wonder I did not get it. We will not mention my age, which does not help, so it seems! We all rode on the left, to have our right (sword-bearing) arm available for a melee in the middle. Then Napoleon wanted to show that he had pacified Europe and decreed that we all ride on the right. Then, the various countries exported their systems to their colonies and the rest is history. I often wonder why America is seen as a problem even as it is called upon to right wrongs caused by others (in their attempts at empire) or rooted in ancient animosities. But the response is, I suppose, clever and witty. I think the humor was directed at me (ie, my phrasing) more than at America. Perhaps it was. Your apocrypha is similar to one I had been given as a child (by a teacher, no less) that maintained that it (driving on the left) was a throwback to the days of jousting. Until I found that jousters rode on the right, not the left, and the lance was presented across from right to left. Destroyed my faith in teachers, I tell you. I almost went back and analyzed just why 2+2 equalled 4. I could understand why the US decided to ride/drive on the right. After all, we had rebelled against the Crown. But why did Canada make that choice? Because Canada, being The Great Satan’s next-door neighbour, didn’t really have a choice. so, basically, Canadians are wimps? Yet they still add that extra (and unnecessary) “u” in color and humor, etc. Why, then, does India, among others (even Hong Kong) retain that left-handedness? Here’s a slightly different version. Interesting that both versions refer to the importance of having the sword arm available for action. Gives new meaning to the concept of road rage! It appears that the left hand driving mode dates back to at least the Roman Empire and changed in the late 1700’s. Wikipedia, if one accepts its verions, has a good explanation. The “sword hand” seems logical on the one hand (no pun intended) but it would seem to me that you would want your shield side facing, not your sword, unless… you are the attacker. Either way, it’s not going very far. Its wheels don’t seem to be attached to the chassis, and without some sort of axle, it won’t be long before the top rolls off and falls onto the road. Who says this is a bus anyhow. I saw a top floor with 3 windows and 2 columns…. The first question should have been “What is this?” in order to determine how many kids vs. how many grownups would have identified this thing as a bus in the first place. And like Vince already touched on, my first reaction was that it’s a trick question, as the vehicle is obviously going nowhere because the wheels aren’t attached. As to the invisible door, the bus could be going either way depending on whether it’s an American or a British model. Besides, it could be backing up. But true, I wasn’t thinking of the door. There seems to be no windshield either, so no matter which way the bus travels, it is bound to crash into something sooner or later. Moving on to the FedEx logo: Apparently, adults do NOT see the arrow in it, but children do. I don’t even see a FedEx logo. Thank you. I’m proud to report that don’t see the arrow in it. My mom will be delighted to know that I’m officially grown up now. I’ll call her tomorrow. But seriously, it’s a similar phenomenon with my cyberquill logo (left). Adults generally do not see the quill sticking out from the screen, but children do. I guess that’s because as we get older we learn that not quills but keyboards are being used to write on a screen, so the adult brain filters out the obvious anachronism. The quill simply doesn’t belong there, so we don’t see it. Fascinating indeed. Grrr … I write “left” and now the darn thing shows up on top. They don’t think it’s a stylus? I saw the quill as floating above the computer. That’s a good sign. It means you’re on your way to adulthood. Once you’ve reached cognitive maturity, the quill will become invisible. I must be an adult. Until you brought it up, I never saw it. Even after, it took me some time to lose the focus and see it pop out. I didn’t even see a bus. I saw an air-conditioned camper parked at Sun City in Arizona with an old guy sitting inside eating tuna from a can and watching baseball on a small TV in July. I can smell the tuna. That’s obvious. Preschoolers are stupid. This is the reason that they don’t get to ride the bus alone downtown. FYI – Your comments were in my WordPress Spam bucket. Naturally, preschoolers would be too young to remember this classic. my first car, bright orange made it to my parents front door then died. I would have been in the 10% of preschoolers who got it wrong. Not sure I even knew the difference between right and left in those days. Who know what sort of subliminal (at least to adults) are being conveyed in Thomas the Tank Engine, Bob the Builder, and Spongebob if kids see things that we don’t! Children see certain things that adults overlook because their mental slates have not been filled up yet. Not even close. But the concept that a door must exist on a bus? That seems odd, almost engineer-ish, for a pre-schooler to perceive. And, as others have pointed out, simultaneously ignoring the lack of wheels being connected to the bus or a windshield for the driver to see or even the existence of a driver. There are two Eskimos sitting on a fence – a big Eskimo and a little Eskimo. The little Eskimo is the son of the big Eskimo, but the big Eskimo isn’t the little Eskimo’s father. Who is the big Eskimo? But it wasn’t at all obvious when I was first asked this question as a twelve year old. I couldn’t think of an answer, and neither could anyone else I knew. And yes, John Edwards is a good answer. But, how about Jacob Zuma? (this may be a tad esoteric, I know!!). The South-African guy, yes. He even looks like an Eskimo. Aspersions are being cast on the veracity of this by certain individuals I’ve conveyed it to. Are you able to direct me to an authoritative source? My “source” is an un-authoritative chain email forwarded by an in-law, I regret to say. Aspersions are justified. Did you break the chain? The story of the “pre-schoolers and adults” has a whiff of urban myth about it (so you appropriately hedged by using the word “apparently”). The claim that “90% of the preschoolers had the correct answer” should discourage any parent from admitting the their child did not think of the missing door. Sorry this answer has to be so far down the page, but there were no more “reply” threads. Any deleterious economic consequences for Canada in spelling the English way, are minuscule compared to what they would be if Canada drove on the other side of the road. Think only of all those many thousands tractor-trailers which go back and forth between Canada and the US each day. They just couldn’t do this if the sides of the road where you drive are different in Canada and the US. Remember, the natural trade routes between Canada and the US are north-south (crossing the border), not east-west (where you don’t). The huge issue of commercial road transportation is why Canada is the only country from the old British empire not to drive on the left. Like agreeing to the same rail gauges. Commerce is a driving force for many standards. Based on what I have gleaned from Wikipedia, it was the Romans who, through empire, spread the left-hand driving; the British who first codified it (that we know of so far); and the US who first resisted it (for reasons of commerce, it appears). Wikipedia supports your quite logical explanation of why Canada shifted to right-hand. Though it appears to have occurred while the US was still the Lesser Satan or maybe even No Threat At All to the world. Nova Scotia, however, resisted until 1923. On an aside, when I visited Hong Kong and Japan back in the late 60’s, I found I had to be very cautious when crossing the street. In right-hand countries, one looks left then right when starting across. Not so in left-hand ones. Wiki has an interesting blip about countries changing from left to right and vice versa.